IMPACT Children’s Theatre, Jean’s Playhouse’s renowned touring children’s theatre troupe, will hit the road again this summer starting on Monday, June 26th. They will begin their weekly productions with the tale of Anansi-Keeper of the Stories from June 26-July 1, Thumbelina on July 3-8, The Bremen Town Musicians on July 10-15, and many more! First up is ANANSI- KEEPER OF THE STORIES. Anansi, a spider of great cunning, outwits the Sky-God Nyami to bring stories back to earth. Based on the folklore of the Ashanti culture from Ghana. Can’t join us for a performance? Don’t fret! IMPACT brings a new show to each of these venues every week until August 19th! IMPACT is fun for the whole family; filled with laughter, original music, and familiar stories told in a new way! Performances run between 45 minutes and an hour with no intermission. Tickets for IMPACT performances can be purchased through individual venues. Tickets for the Jean’s Playhouse performances are $7.50 for children and $5 for adults and can be purchased online at www.jeansplayhouse.com, at the door, or by phone by calling our Box Office at (603) 745-2141. Yes, that is correct, ADULTS get a discount for IMPACT at Jean’s! IMPACT Children’s Theatre begins its touring season on Monday, June 26th. You don’t want to miss it! Jean’s Playhouse is a non-profit performing arts center that operates the professional Papermill Theatre and IMPACT Children’s Theatre Companies in the summer and fall and the community Playhouse Players and Jean’s Teens theatre companies in the winter and spring. Jean’s Playhouse also offers a limited year-round guest artist series of magicians, comedians and musicians. Jean’s Playhouse is located at 34 Papermill Drive in Lincoln, adjacent to RiverWalk Resort at Loon Mountain (newly opened!) off I-93 Exit 32. Visit JeansPlayhouse.com or call 603-745-2141 for more information. 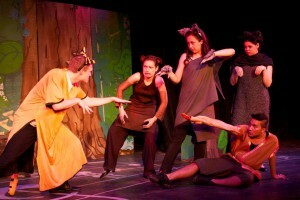 Attached Photo Caption: IMPACT Performs The Jungle Book in previous summer at Jean’s Playhouse!